Claire woke with her heart pounding. She’d had the same, damn dream again, the one with a massive owl flying in a misty forest, and her stuck in a dress like a blueberry meringue. This was the third month of waking abruptly from that image; it was unnerving. She slipped out of bed, careful not to lift the covers and send a chill across Yvette’s legs and wake her. Groping through the dark, she found the knob and inched the door open enough to sneak through. Once in the hall, the moonlight coming in the far window got her to the stairs without knocking her shins into the eighteenth-century English tea table or the Jin Dynasty vase. Downstairs, she made tea and pondered her dream. What in the hell did it mean? Why the dress? She’d never been one for dresses, even as a little girl. When her mother had made her wear one, she’d cavorted around the yard like a puppy, showing her underpants and covering the skirts with grass-stains—her mother had stopped trying after that. And why the swirling mists? They’d been more like ropes than water vapor. Just before she’d woken, the mist had tangled around her legs so that when she’d tried to move, she couldn’t; they’d tied her to the skeletal forest as perfectly as shackles. She shuddered and stood, pacing into the living room. “Claire, you are being loopy,” she said to herself, clicking on a lamp and settling down in the one piece of furniture that was comfortable—her grandfather’s Naugahyde chair. Yvette had frowned when she’d brought it home after his death that summer. But, because it was the one piece of furniture Claire really cared about, her partner had finally relented, regardless of how it looked next to the Louis the Fourteenth fauteuils. Claire pulled the afghan—another remnant from her grandfather’s house—around her shoulders and yanked on the chair’s lever to kick up the footrest. It protested with a squeal, but clanked into position, allowing her to stretch out her legs. As she leaned over to spread the blanket across her feet, a glint of something on the floor near the chair caught her eye. She looked closer, and found the tail end of a red ribbon sticking out from under the chair. 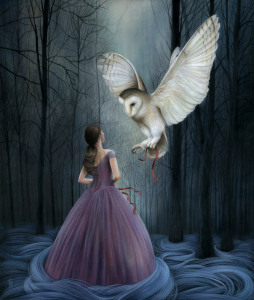 Her vision narrowed and she felt the world tip; she’d seen this ribbon in the talons of a bird, the dream owl. She pulled the end of the shining strand, feeling resistance on the other end, something bumping the springs and metal rods as the ribbon brought it from its hiding place. What emerged was a bundle, wrapped in purple silk, tied with the red ribbon. Scarcely breathing now, Claire brought the thing into her lap and slipped the ribbon from the cloth, letting it fall away to reveal the bundle’s contents. A carved crystal, the size and shape of an egg, lay nestled in a bed of white feathers. Immediately, her gaze was tugged into the endless facets. In the next breath, she felt herself following, head-first into the maze of prisms. She tried to look away, but the room began to fade beneath glinting rainbows which swirled this way and that until the color became white mists twining around skeletal trees. Just as Claire felt the cold twisting fingers around her ankles, the footrest of her grandfather’s chair snapped closed with a resounding crash. The room sprang back into focus as the crystal egg launched from her lap. With shaking fingers, Claire picked up the nest and scanned the floor. She found the egg winking beneath the edge of Yvette’s Turkish settee. Keeping her gaze averted, she picked it up and wrapped it back in the silk, concealing it completely. A flash of white at the window made her look up. Golden eyes on a swiveling head met hers, and once again she felt caught out of time. “It’s this you want,” she said, her voice a whisper, or perhaps nothing at all. Opening the window, she laid the bundle on the sill. A brush of fall air, the softest rustle of feathers, and then the night was still. The crystal and silk were gone. With shaking knees, Claire climbed the stairs and slipped back into her blankets. Yvette murmured in her sleep before rolling over to lay an arm over Claire’s belly, tying her as perfectly as a life-line to their bed. Beautiful story. I love the imagery you evoke. Good word pictures. I really like fanciful stories. Thanks Judith! I love being able to make anything happen in my stories–that’s why I tend to write in the fantasy genre. Thank you Suzanne. I love to fall into a story myself, and those little details sometimes are what catch me up in the scene. Glad you liked it. Your switch from Claire in real life being sure that she was simply dreaming to the realization that there is a connection between the dream and reality was so smoothly handled: “Her vision narrowed and she felt the world tip.” I almost felt the world tip myself as I read that! The mystique of the second half of the story, after that realization, is fantastic and very engaging. And I love the final, sweet and comforting image we’re left with, as if to say everything is again as it should be – while leaving open the possibility that there could be more strange dream-life crossovers to come. I like Sandy’s idea as well! Thank you for your lovely comments. It’s so encouraging to hear people enjoy the snippets of world I build. When I write, it’s almost as though I’m the reader at the same time. I can be pleasantly surprised by what my characters end up doing, which keeps writing so fun. I love when that happens! Always nice to hear about how other writers write. I love the smoothness of your writing style. This was an easy and enjoyable read. I fell straight into it as though having a pleasant dream. I love the way you used the prompts. You truly know your furniture. I feel like I’ve visited the house and know every nook and cranny. The prism as an egg is just brilliant. This is a wonderful piece of writing, and a joy to read. Thank you for your kind comments! Google is a wonderful thing…can you imagine being a writer trying to research furniture on the spur of the moment in 1990? Terrible. 🙂 I am glad to hear you felt the story flowed. I did labor over it a bit (getting it down to 750 words was tough) so I’m happy it worked. Getting it down to 750 words is probably the toughest part. At least it is for me. You did a terrific job. What a charming take on the prompts. I love the surrealism, flow and you really nailed the art of detail. Good, good writing! Thanks so much Susan. I really like reading “magic realism” myself, and so wanted to give it a shot (my novels are all pure fantasy). Glad it worked out! Nicely done! Good details of furnishings and introduction of mystical elements. You didn’t resolve the issue of why she was wearing the dress in the dream–that has intruguing possibilities. And I seem to connect Yvette’s anchoring arm to the anchoring tendrils of fog/mist and the talons of the owl. Is the owl Yvette’s dreaming spirit? Do the two have an alternative dream drama/existence that runs parallel or even counter to the this one in RL? Oooooh Sandy, I like your ideas. Why not write a continuation of this story, and do a guest post on my blog? Would you be up for that? Please read Intriguing for the typo above! I’m nhalf asleep tonight! I didn’t even notice, Millie. I read so fast, and my spelling is so bad without a spell checker–my eyes just flew over it. An intruiging interpretation of the given image, Mara. I love your phrase, ‘stuck in a dress like a blueberry meringue’!